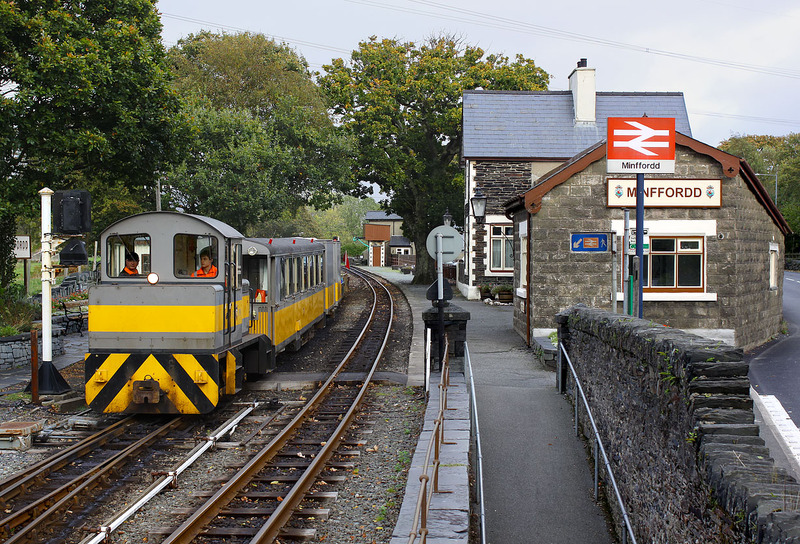 Ffestiniog Railway 0-6-0 diesel hydraulic loco Harlech Castle pulls away from a brief stop at Minffordd station on 19 October 2014, with an engineering train heading for the nearby Minffordd Yard. Harlech Castle was built by Baguley-Drewry Ltd in 1983. It had originally been destined for use in Mozambique. As delivered it fouled the Ffestiniog loading gauge, and was only able to be used in Minffordd Yard. After being fitted with a reduced height cab, it was able to be used all along the line, as a civil engineer's loco.